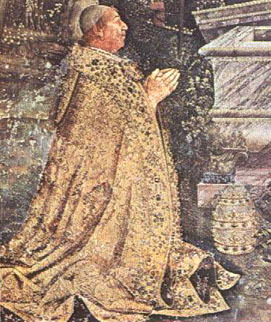 Alexander VI (1431-1503) was one of the Borgia family, notorious for their many excesses. He was believed to have reduced Rome to unparalleled depths of depravity, and the city teemed with assassins and prostitutes of both sexes. Alexander was himself much given to womanizing, having sired eight or more children, including the infamous Lucrezia Borgia, but he was apparently not averse to the charms of young men as well. His simoniac politic and scndalous behaviour was branded by Savonarola, a dominican friar of Florence, who during his homilies called him publicly - "simoniac, heretic and unfaithful". Alexander VI, annoyed, condemned Savonarola to the stake.